Android vs. iPhone: Which Has the More Advanced Users? It seems the mobile world is full of silly little battles these days. You've got the AT&T-Verizon ad assault. There's that ever-popular Droid-iPhone rivalry. And then, of course, everyone's favorite Google Phone debate: Is there a Google Phone? If there were one, would it harm other Android phones? Or could it become -- gasp -- the elusive iPhone killer? We won't be discussing the Google Phone any further here today (you can thank me later), but we will be keeping with the spirit of trivial competition. Personal preferences aside, I think we can all accept that the Android and iPhone platforms both have their strengths and weaknesses. So our new battle: Which mobile system has the more advanced users? Ready? Our first measure of advanced functionality is the mobile Web. Both the iPhone and the Android platform are designed for easy Internet browsing -- so which platform's users are most likely to take advantage of the InterWebbial SuperSpeedway? Turns out it's Android's. According to new data collected by Nielsen and compiled by eMarketer, owners of Android phones are the most likely to use their device's Internet functionality. Ninety-two percent of Androiders say they take utilize their phone's Web connection, compared to 88 percent of iPhone owners. Both devices are well above the curve for smartphone owners in general, however, where the overall Net-using percentage is only 71. 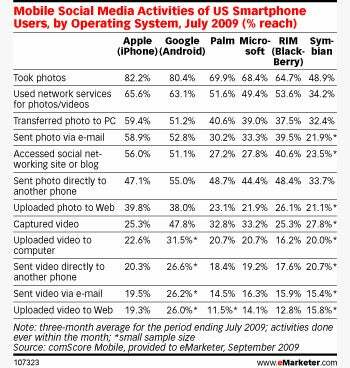 If Android owners are slightly more Web-enabled, iPhone fans are slightly more social. As this chart of ComScore data demonstrates, iPhone users come out on top when it comes to most advanced social-oriented phone activities -- everything from sharing photos to spending time on social networks and blogs. How 'bout them apps? This one may be a bit surprising -- after all, you'd expect to see iPhone owners apping it up more often, given the 100,000 options at their fingertips. Android owners, however, come out just barely ahead in the relative realm of application usage: Seventy-six percent of them say they utilize apps, according to Nielsen, while 74 percent of iPhone owners say they make use of their mobile programs. Here's the good news: Both iPhone and Android users can grab some bragging rights from these studies. The truth is the two platforms are neck-in-neck when it comes to using most of the so-called "advanced functions" -- and practically every other mobile phone system is struggling to keep up. See? We all have something to celebrate. Just don't tell AT&T and Verizon, or they're liable to start another ad war over it.